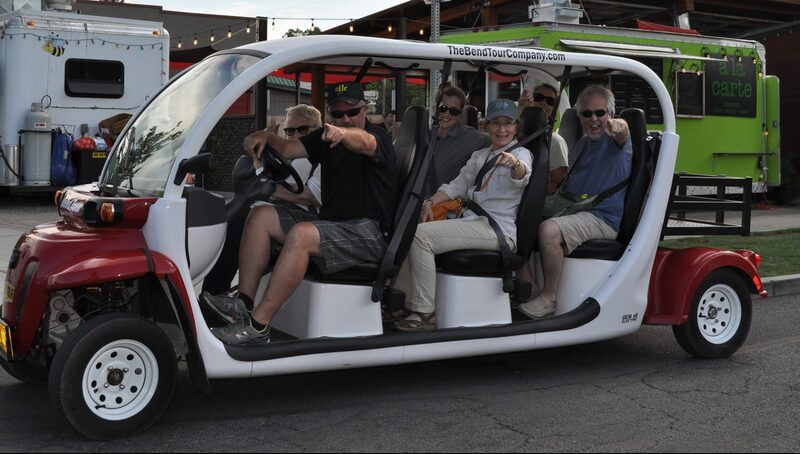 The Bend Tour Company open air electric car scenic sightseeing tours are informative and entertaining explorations of Bend’s past and present.All of the history, sights and attractions and MUCH more! 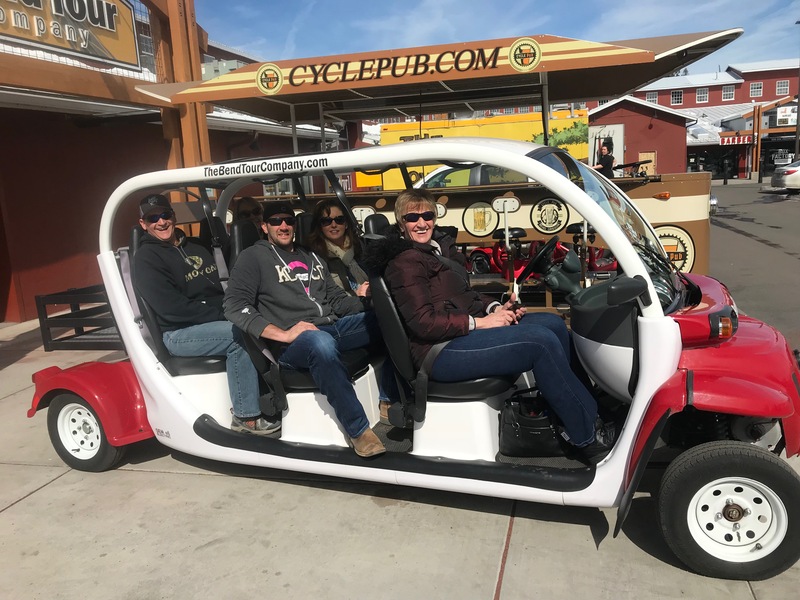 Experience and enjoy Bend from the comfort of our cruiser cars as they propel you through the historic Old Mill District along the Deschutes River, Whiskey Flats, Drake Park and in and around Downtown Bend. Our Bend City Sights Electric Cruiser tour highlight’s more of Bend’s unique past and present by taking you around more of Bend than you can imagine! An incredible outing aboard our open air electric touring car. Relax as we quietly whisk you around to vibrant and historic city sights to discover all that Bend has to offer. No matter if you landed in Central Oregon five minutes ago, five years ago or five decades ago, this unique cultural tour is one of the best ways to experience Bend. Taste the Bend's best craft brews, go behind the scenes of incredible breweries and enjoy a mini-city tour with fantastic scenic views on our Craft Beer & Brewery Tour of Bend! We take care of everything.... All you have to do is to enjoy this great craft beer experience! Our Bend City / Brewery Como Tour is the perfect alternative for folks who want the best of both of our most popular tours in one experience. See the incredible sights of Bend Oregon and enjoy a couple stops along the way to visit the best breweries and enjoy delicious samples Bend's famous craft beer. All in one fantastic offering. The Ale Trail Passport Express Tour is the fast n fun way for you to do the famous Bend Ale Trail. This fast paced two hour tour whisks guests around Beer Town USA to get their Ale Trail Passport stamps from 11 craft breweries along the trail . You get a great mini city tour of Bend, quick stops at incredible breweries and of course ... working to fill-out your Ale Trail Passports for fantastic prizes and lovely parting gifts. There is more to life then just beer...Just kidding! However many folks do prefer their beverages distilled or from grape vines and not hop vines. As such, we created our Wine & Spirits Tasting tour as a brewery alternative for folks to enjoy the many Drinkable Diversions along the Bend Ale Trail. Sip, Shoot, or simply enjoy the many adult beverage alternatives that Bend has to offer! Climb aboard our open air electric touring car for an entertaining lap around Bend. Discover the vast and varied cultural contributions of a thriving Central Oregon arts community. From roundabouts to studios, alleys, backyards and beyond art awaits you at every turn. 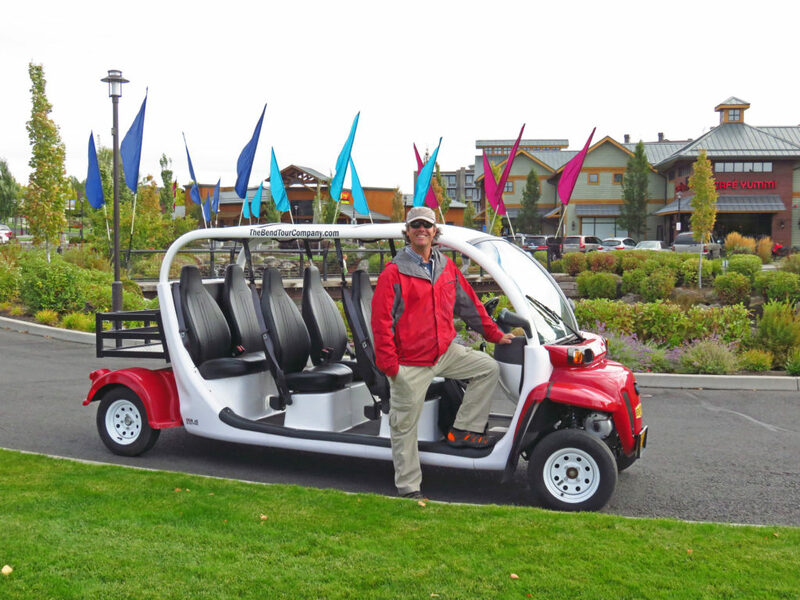 Our open air eCruiser is an amazing way to experience one of the best times of the day in Bend..SUNSET! Take our extended tour of town featuring sunset moments at scenic spots blended with a balance of history, tall tales, and sunshine fun. The eCruiser Cascade Sunset Spectacular is a fantastic way to finish up your day enjoying all that Bend has to offer!